2015 was all about content marketing. Brands realized they needed content, and a lot of it. Things kicked into high gear as marketing teams struggled to fill nurturing programs with assets. Customer journeys, personalized marketing, retargeting, account based marketing and increased implementation of marketing technology stacks all fueled this insatiable thirst. The results, not surprisingly, were often a case of more not being better, but simply more being more. A huge challenge – and thus, we predict, a huge trend in 2016 – will be for brands to up the quality level while producing enough quantity to fill their programs. Making better content is important, got it. So, how do we do it? The old processes and rules need to change. You need to streamline workflows, put serious resources into repackaging already-good content into new forms targeted appropriately, and most importantly, get a thorough understanding of your customers. It’s not enough to create personas based on demographics or even behaviors. You need to understand what motivates people, what they’re trying to accomplish. Once you know what drives someone, the path to creating content that engages and moves them toward purchase and loyalty becomes clear. The megatrends of mini-customer insights, people looking for emotional connections and a maturation of the content marketing ecosystem are converging. We predict 2016 will be the year a deep understanding of your customer will power quality content that creates irrational loyalty and bonds between your customers and your brand. From leadership to management and marketing to innovation, Commanding Business covers a variety of topics with an aim to uncover actionable takeaways you can implement in your own organization today. Episode synopsis: To become a financial asset for your company a brand needs to have an essence, a promise and a personality. Building your brand requires sustainable differentiators, scientific research and most importantly, focuses on your customer’s point of view. Your brand should also closely resemble the strategy of the business to benefit your end customer. There are three questions your organization needs to answer to achieve top of mind awareness within your business sector. 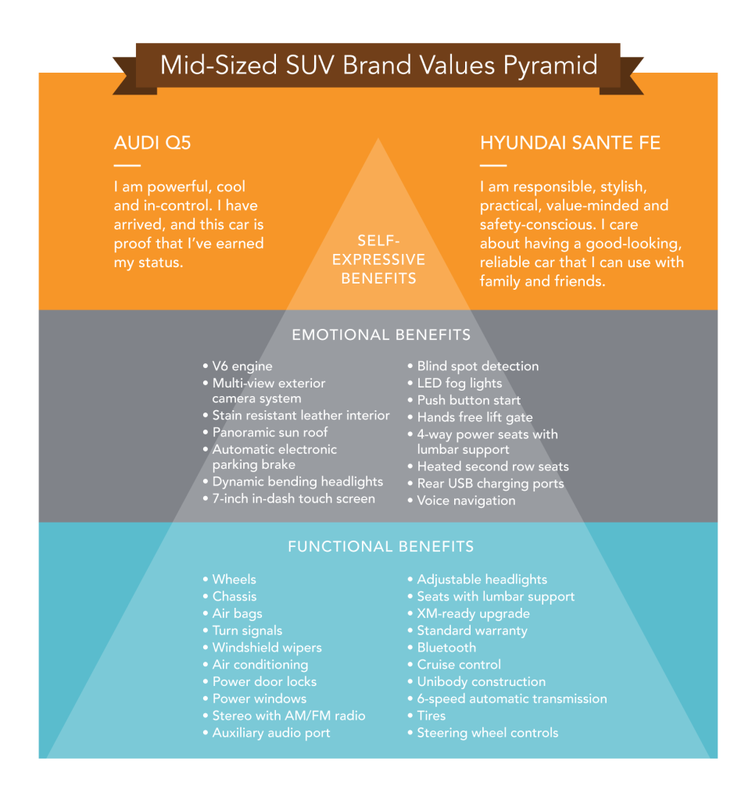 When you have answered the three questions you have the criteria for the top of your brand value pyramid. Today's marketers have pigeonholed millennials into a vast group of faceless, nameless people. Let's be honest: between the ages of 18 and 34, they range from living on Snapchat to buying houses. Who truly thinks you can target consumers across so wide a spectrum? Please help our session make it into SXSW Interactive 2016 by voting for us in the SXSW PanelPicker! Deb Gabor and Cliff Sharples have worked together to successfully profile, identify and target consumers to create business success for leading digital media and internet firms, including HomeAway, Cheezburger and now Fexy Media. In this session, they’ll discuss how to leverage consumer insights to understand who your customers really are, how they behave and what they care about -- so you can build a powerful emotional relationship with them. What is the fallacy of marketing to millennials? How should you be profiling, targeting and segmenting your audience? What are the characteristics beyond demographics that allow you to dial in your brand to make the most powerful relationship with consumers? We'll talk about all this and more... if we make it into SXSW! Voting closes at midnight this Friday, September 4. To vote, visit our page on the SXSW PanelPicker. You can sign in with Facebook or create a quick and easy account, then give us the "thumbs up" to vote for our panel. Sometimes we mess up. Royally. Unforgettably. Disastrously. And sometimes when we mess up, we damage others’ property or even hurt their feelings. When that happens, it’s time for an apology. As our big Jewish Day of Atonement looms, it seems an opportune time to discuss what I’ve learned about how to say you’re sorry and do it right. For the Jewish people, this time of year is the season of repentance. Starting with Rosh Hashanah, the Jewish New Year, and extending through Yom Kippur – the most serious and solemn of all holidays on the Jewish calendar – we Jews fall on our swords and ask forgiveness for our sins of the past year (for those of you familiar with Catholic traditions, it’s kind of like an “instant Lent”). During the past week, I’ve been systematically collecting and cataloging the last year’s mess-ups, preparing to amend my wrongs and ask others for their forgiveness. Having been on the giving and receiving end of bad apologies, I realize that now is the time to give my apology skills an overhaul. Now with this post you can benefit from my experience. Making good apologies isn’t difficult. The 12th century sage Maimonides said that true repentance requires humility, remorse, forbearance and reparation. Not much has changed since then. Don’t offer too much explanation: Keep explanations short and relevant, and, above all, don’t use them as justification for your actions. “I’m sorry I rolled my eyes at you during dinner, but you were droning on and on about the same topic for what seemed like hours,” is not an effective apology. Finally, mean it when you say it. When you apologize, feel sorry in your heart. When you’ve said your piece, let the other person have their say. If they need time to process, let them process. Even if they say nothing but “I accept your apology,” just politely say “thank you.” If the other person remains angry, you have to sit with that for a while. And, if they don’t accept your apology the first time out, it’s your responsibility to try at least two more times. If they still don’t accept, it’s time to assess the overall state of your relationship. In all, making a good apology means being a little vulnerable. In his book On Apology, author Aaron Lazare said, “Apologies are one of the most profound interactions that can happen between people. Apologies can heal humiliation, free the mind from deep-seated guilt, remove the desire for vengeance, and ultimately restore human relationships.” I totally agree.